Q: What is the proper way of curing papercrete? A: The best way to cure papercrete that I know about is to simple allow it dry out naturally over time, with as much air circulation around it as possible. Q: Once cement powder is added to paper slurry, how long does it take before the mixture begins to harden? How long is a batch workable? A: Papercrete sets up very slowly compared to concrete; it takes days before it becomes quite firm, and can be worked for about 24 hours, if kept moist enough. A: If you are building a papercrete wall with slip forms that are say 2 feet high, you can often reset the forms every 24 hours, but you have to be very careful to watch for slumping of the green papercrete. It is safer to slip the forms maybe three days after the pour. A wall that was poured horizontally (on the ground) would have to cure for maybe two weeks before it would be safe to raise the wall into place. Temperatures and humidity also make a difference in how quickly the papercrete cures. Q: I am a sculptor interested in making an outdoor sculpture of papercrete. Would it be better to force papercrete onto a mesh armature or earth/sand cast it? A: I have worked papercrete into a wire armature, but have never tried to cast it in sand. I would say that the answer depends on a variety of factors, including how delicate the sculptural form might be, how it will used, what formula is used for the papercrete, etc. Q: Could I use papercrete to pour into plaster molds to make decorative ceiling tiles? I am looking for a material that is inexpensive and light weight. Can I add vermiculite to the mixture as well? A: I think that what you suggest would be an excellent use for papercrete, since it is lightweight once it dries and will conform easily to any mold. You may want to experiment with various mixes of paper/cement to see what works best. Adding vermiculite should not be necessary, and might actually weaken the final product. Go for it! Q: I am in interior design school, and I am working on a project which includes half partition walls hopefully out of something like papercrete. 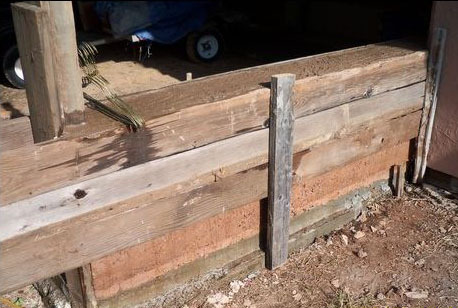 What I want is to make a mold out of wood planks which would leave the indentations of the planks as well as the wood grain in regular concrete. My question is would papercrete react the same way? Would you be able to see the wood grain in it? A: To some extent you would probably see some indications of wood grain with molded papercrete, but not nearly as well as with concrete or plaster. The paper tends to clump into its own grain pattern, which would obscure the grain of the mold. Q and A: I am looking to build a large storage building using papercrete. It will be located in southeast Missouri so we get the typical 4 seasons here. My first question is on block creation. I was thinking of creating blocks that are 5.5" x 24" x 8' long. These blocks would have nubs and recesses on them similar to a lego. I would then mortar them together to create the walls. My question is I was thinking it would be better (the blocks would be more uniform) if I made the forms about 30" tall and then had a press that would compress the slurry down to finish size. The excess water then would run off. Am I completely crazy or does this make sense? Compressing the slurry like you suggest is certainly a possibility. I heard of one experiment where a fellow planned to make commercially available PC blocks by compressing the slurry, but it ultimately didn't pan out. You end up with a much denser material that doesn't have as good of an insulation value by doing this...and there may have been some other problems too. Excess water naturally drains out of PC very quickly, leaving a product that is about right for building. With blocks as big as you suggest, the weight of the denser block could be an issue as well. I see all kinds of info of sealing PC. I was planning on putting a layer of stucco on the exterior, then painting with some type of concrete sealing paint such as Drylock or a pool epoxy. Would this provide the protection I need for my area? I suggest experimenting with these materials in advance to see what works best. Also would it be better to seal the inside with some sort of paint or to let it breath? My concern is the high humidity we have in the summer. I am generally in favor of keeping walls as breathable as possible, and making sure that water is kept off them with large eaves, etc. The potential problem with completely sealing both sides is that if moisture does get in there somehow, it can't escape...and then other problem can occur, such as mold, or the sealer pealing off. On the other hand you definitely don't want any part of the wall to remain damp long enough for mold to form. Q: I want to build a dome. Is it possible to fill up plastic bags with papercrete (instead of earth) and build a dome with it? A: The problem with using plastic bags to do this is that the papercrete needs to drain and evaporate water in order to dry and cure, which would never happen in such a bag. I know somebody who did something similar by using woven polypropylene rice or sand bags (which do allow some drainage and air to circulate) to form large blocks of papercrete, then removed the bags when they were sufficiently cured and reused them. This worked pretty well. Q: I have read about Sean Sands' style of dome building, and would like to know more about it. The main question I have is this: does he use some sort of form that he removes after the mortar has set? I understand that each course of block locks in on itself, but how does it stay in place while the course is being laid? A: My recollection is that Sean did not use forms to build his papercrete domes. He may have used some temporary supports, like poles, at times, but generally he either placed the blocks in such a way that they stayed in place by themselves, or perhaps spiked adjacent blocks together with steel pins. Once the shape comes together, it is self-supporting. Q: How many bricks will one batch of papercrete make using the 60/20/20 formula? A: I can't really answer your question without knowing the size of the bricks you want to make and the size of the batch your mixer can make. In general, I would say that the volume of slurry will reduce to about half that size for a cured brick. Q: I am curious about papercrete. I had an idea for siding, as my house is in dire need of it. I would like to try making perhaps two inch thick boards using papercrete and either screwing or bolting them to the outside walls, and then coat with surfacing such as stucco. Do you think something like this might work, perhaps molding with a mesh or reinforcement to the back to support it? A: This sounds like a fairly difficult proposition to accomplish, but possible. I think you would definitely need to use a reinforcing mesh to keep the PC boards from fragmenting. Adding the PC would give you some exterior insulation, but if you don't need this it might be easier to simply stucco the existing exterior of your house. Q: My mom is trying to build a papercrete house in Northern Arkansas. It is starting to get freezing temperatures here, and we were wondering how the temperature would affect the papercrete during the drying process. We have been told that freezing tears the fibers therefore damaging the blocks. A: It is best not attempt making papercrete in freezing weather, mainly because the cement will not cure at these temperatures, and if it is covered over to protect it from the frost, then it can't dry out. Besides, working in the cold is no fun. Once the papercrete is cured, freezing weather will have no affect on it, even if wet. Q: Would it be best to start the mold process for a plastic mold that is 1.5" deep and then wait until it is almost hardened, and turn it over for better drainage of the water? Of course maybe the mold won't set correctly and when the product is cured, a lot of definition was lost. If so, do you recommend any type of water reducer in the mix? Or is 1.5" not deep enough to worry about? A: I think that the best approach here would be to drain almost all of the water out of the PC before attempting to place it in the mold, then there wouldn't be enough water in it to worry about. You can do this fairly easily just by squeezing the wet PC with your hands to expel the excess water, then push the clay-like material into the mold. It should cure enough in a day or two to remove without losing molded details. Q: I need some papercrete advice - the Mason Greenstar blox are as expensive as ICFs - the livinginpaper.com web site uses different methods (rebar) and possible slip forming and says it is affordable - I am unsure how to proceed for my house and for others in community - can you give some guidance on this? A: Hmmm...interesting question: commercial PC blocks vs. slip-formed PC walls. It sounds like you have pretty much settled on papercrete as the main wall material, and it should perform pretty well, especially in the fairly arid Amarillo area. The insulation value is good. With good passive solar design, and plenty of thermal mass material on the inside, your home should be pretty comfortable. It may not be so easy to sort out the economics of the choices you mention. The manufactured blocks have the advantage of being ready to assemble, without the need for forms and large-scale PC slurry manufacture, both of which require time and money. I presume that the blox can be assembled with relatively little slurry as a mortar, so this is much more manageable as far as necessary equipment and time. So when you factor in these things it might be a toss-up? I've been around several large-scale PC wall pours with slip forms, and it is a big, hard, and messy job, that goes on for days and with many potential pit-falls. Laying pre-manufactured box is likely a lot easier, especially for folks not used to the heavy duty work of pouring concrete, which is a similar operation. Q: I am going to try my hand at building with papercrete. I am planning to finish off and insulate half of my pole shed. It is pretty standard pole shed construction I presume. It has 8x8 poles distanced about 8 ft apart and tin for the exterior skin. What I would like to do is slip form between posts. I would like the wall thickness to be around 10 inches and I was hoping to make my pours around 10 or 12 inch increments. Is it possible to make a slip form on the interior of the shed and use the tin and 2x4s for the outside of the form? With papercrete do I have to put up vapor barriers? A: Slip forming with papercrete can be done successfully and I know of several projects done that way. As for using the existing tin as part of the form, it could work if it is stiff enough, but the main problem that I see is that it would take the PC much longer to cure than if the form were removed as you proceed up the wall. PC needs to breathe in order to cure, so the metal would hamper this. For the same reason, I do not recommend using any sort of vapor barrier with PC; if it can't dry out entirely it can eventual harbor mold, which you don't want. C: I have been slip forming papercrete walls, or in my case I might call it paper adobe because my mixture is (by volume) 3 parts wet paper pulp, 2 parts fine clay, 1 part portland cement. This formula works very well for me and dries very quickly. Q: I saw set time is around 30 minutes; about how long (on an average) for a brick to actually dry? A: Depending on the size, temperature and humidity it can take anywhere from a few days to a few weeks for it to dry out...and it is necessary to arrange the material so that it has as much air circulation around it as possible. It is because of all that paper fiber that holds a tremendous amount of moisture (like a sponge). It sets up enough to remove a form within a couple of hours or less, but doesn't really get firm until it is dry. This fact can also be a problem in some applications where raw PC is exposed to a moist environment; it won't fall apart when saturated with water, but it loses much of its insulation value and can harbor molds if it stays damp and warm for too long. Q: I am looking into the possibility of using papercrete as an interior insulation for a home built out of shipping containers. I'm hoping that by building interior papercrete walls, I'll avoid a lot of the moisture issues associated with papercrete (building in Texas in a supposedly watertight structure), and that the walls will add some structural integrity. My question comes in when it comes to pouring the papercrete into forms - I'm thinking it would make the most sense to cut a section of the corrugated steel out and use that as the bottom of the form, so that my finished papercrete will be in the shape of the corrugated steel and will therefore fit well into the inside of the container. So, question one, do you see any problems with that plan? And question two, what would be the best way to affix the papercrete to the container once it has cured? A: This all sounds reasonable to me. At first I thought you wanted to pour the PC in place, which would not be a good idea, but then I realized that you were thinking of just using the shipping container panel as part of the form and curing the PC outside. The only possible problem that I can see with this is that PC shrinks as it cures, so it may not fit perfectly onto the interior walls. Shrinkage can be mitigated to some extent with the addition of mineral material (such as sand), but this also reduces the insulation value and makes the panels heavier. I suggest that you do some experimenting to find the optimal formula for this. As far as adhering the PC to the metal inside, I might suggest trying common builders adhesive which comes in convenient tubes for application. Q: I would like to know if it is possible to make papercrete furniture? A: While this might be possible, I would not particularly recommend it since papercrete is fairly fragile. You would need to have a wire mesh armature, use a lot of sand and cement in the mix, and coat the cured product with a protective finish. If you did this you could create some rather fanciful furniture. Q: I want to build a portable house using ICF's, but to use papercrete instead of the regular concrete to get a light weight. Do you think it is possible? Will the papercrete mixture dry? The walls are 2.5 meter high with 7-8" thickness. A: No, I don't think that papercrete would work as a replacement for concrete in ICF's, because it needs to be able to drain and cure in the air for a long time. It doesn't "set up" in the same way that concrete does. Q: For making papercrete blocks on the net all seem to be bricks; would there be advantages (disadvantages) to place a couple of 4" pvc pipes in the center (and then pull them out before the block hardens) to create more of a cinder block rather than the bricks typically shown on the net? A: The only possible reason to do this that I can think of is to create a void where, when the blocks are aligned properly, a reinforced concrete column could be poured to help stabilize a wall. In general I think this practice would weaken the blocks and be more trouble than it is worth. Q: Is it possible to use papercrete in composite tubular column? A: Papercrete can be formed in virtually any shape, but bear in mind that it doesn't have much compressive strength, so it may not serve your needs.